Health savings accounts (HSAs) continue to grow in popularity, with over 25 million people enrolled in HSAs at year-end 2018 and total assets reaching approximately $53.8 billion. That growth isn’t expected to slow anytime soon, as HSAs remain a powerful tool to help combat the rising costs of health care. While the total number of HSAs and deposits are higher than ever, the average account balance is only slightly increasing. The Devenir 2018 year-end report‡ shows that average account balances are slowly increasing year-over-year despite the increased popularity of HSAs as a long-term tax savings vehicle. This indicates that HSA accountholders are spending the majority of their HSA contributions for the particular year on healthcare expenses instead of rolling over contributions, which can be saved or invested for future health care expenses. 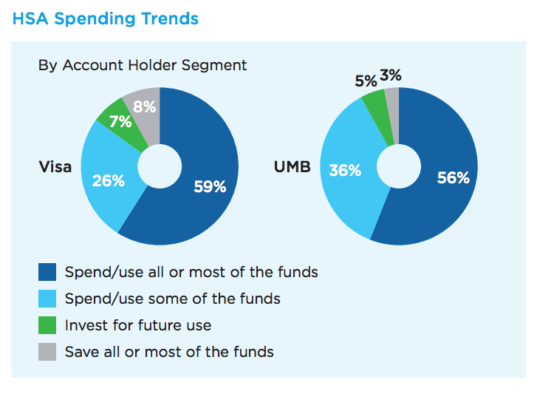 UMB Healthcare Services is also seeing this trend among accountholders – annual segmentation data findings show the average account balance in 2016 was $1,472, while the average account balance in 2017 was $1,741. If overall contributions are up, why are individual balances remaining relatively flat? HSA accountholders are continuing to contribute to their accounts, but rather than saving these dollars for the long-term, they are increasingly using those dollars to pay for rising healthcare expenses as they occur. Despite an average contribution of $1,900, the average ending account balance for 2017 increased less than $300 from 2016 – which indicates that even as accountholders contribute more, they’re also spending more. The 2017 Visa FSA/HSA Consumer Research Study‡ reports that 59 percent of participants planned to spend or use most of the HSA funds they contributed for that year by year-end. 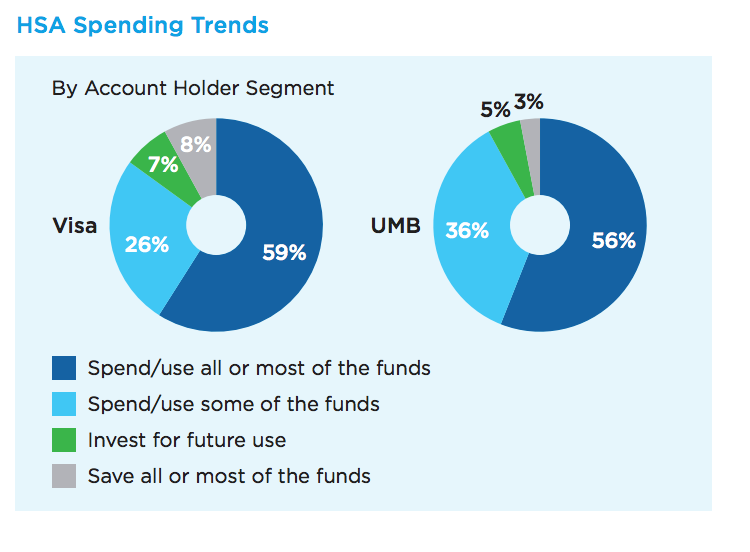 Again, this trend holds true for UMB’s accountholder segments. Americans are spending more for healthcare, but their total usage of health care services has decreased. According to the 2017 Health Care Cost and Utilization Report‡, spending growth in each year from 2012 to 2017 was almost entirely due to price increases, particularly in administered drugs, emergency room visits, and surgical hospital admissions. Again, this trend holds true for the UMB HSA Spender population as shown in the UMB HSA Customer Merchant Category Code (MCC) Spend Chart below. This chart outlines how the payments industry categorizes types of merchants and the HSA spend within those types. According to the Centers for Medicare and Medicaid Services, healthcare spending is projected to hit $5.7 trillion by 2026, a 5.5 annual percent rise from the current $3.5 trillion. The growing cost of health care is not expected to reverse anytime soon. While HSA owners are spending their HSA funds on the right types of purchases, increasing healthcare costs are preventing them from taking full advantage of their HSAs. With healthcare costs on the rise, HSA account holders will be faced with spending more of their HSA dollars on current health care expenses rather than being able to save for future health care costs. Learn more about UMB Healthcare Services, which ranks fourth in total accounts and fifth in total assets among all HSA providers (Source: 2018 Year-End Devenir Report‡).